Ever wondered how a “Downton Abby” themed wedding would look? Well this is it. Victoria is famed for being more “English than England” (being English I’m just going to say that the claim is a little bit of a stretch) but when you throw in a Hatley Castle you really are pretty much there. We love Hatley Castle. Its such a stunning venue and full of character. Its also home to The X-Men, and thats pretty cool too. I don’t think we’ve ever seen a bride take so much care in designing wedding decor. The attention to detail is simply stunning and Alli’s hard work paid off to create a warm and charming environment. There are several shots in the film which feature the details, but really, you had to be there to appreciate the effort. As with any wedding, the details, the dress and the venue all contrite to the overall “personality” of the wedding. But in the end, the most important part is the celebration of two people in love. From the letters that Alli and Eric wrote, to their vows, speeches and incredibly touching moments (yes, Eric really did spontaneously serenade Alli) this wedding was bursting with love. 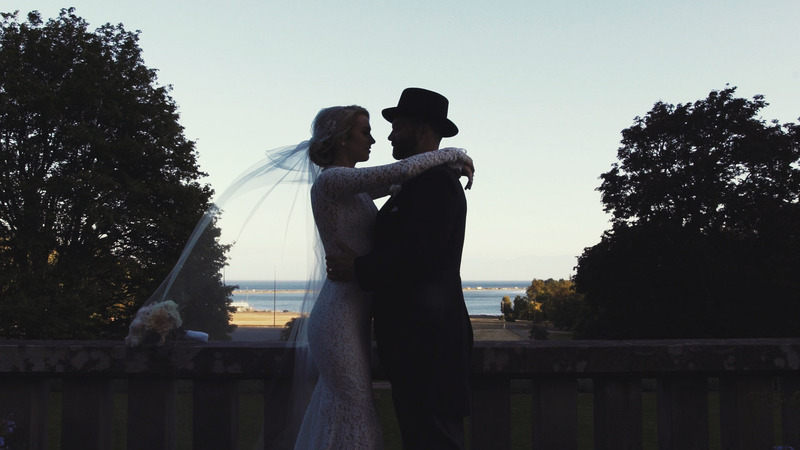 This wedding was a film-makers dream. Amazing production design, unique characters and plenty of emotional moments. Thank you Alli & Eric, for making our job so easy and joyful. I am speechless and full of tears!! That was absolutely amazing!!!! I just wanted to touch base and say a MASSIVE thank you for that highlight video. The day I posted it to my personal Facebook, it got over 1500 views and literally every person I knew was reaching out saying they had never seen a wedding/wedding video like that in their lives, and that their brothers/boyfriends/fathers were even bawling watching it. And it was only because of the way you captured everything so perfectly. Every time I re-watch it I start crying again. It is absolutely priceless to have this as a memory and it was definitely the best wedding decision we made of having you there!